While cleaning today I managed to find all sorts of wonderful yarns I dyed with natural dyes a long time ago, this was rather exciting as I thought they were permantly lost. 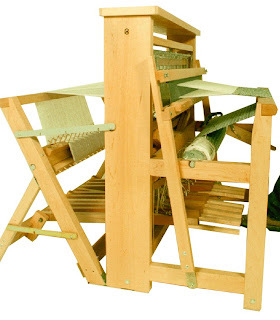 I also unearthed my floor loom, Leclerc you can see them here http://www.leclerclooms.com/ I'm thinking a tapestry might be in order, I have plenty of bindweed to pick and dry, hadn't gotten to the lawn work yet so am thinking it's an excellent candidate for my newest project. It'll take awhile to get this project off the ground, first the bindweed has to be picked and dried properly, and I need to dye up some warp thread. Older PostAnd now to find furniture!